In prose that sparkles with wit, shocks with insight, and beguiles with the air of legend, these seven stories take the reader from post-apocalyptic Tasmania to the tragedy of surrogate pregnancy in the 1950s. Loss of species, the whims of publishers, the question of Islam in regional Australia – these are among the subjects Carmel Bird addresses in her characteristic probing style. CARMEL BIRD is the 2016 winner of the Patrick White Literary Award. Carmel’s work spans forty years, and she has published thirty books. The most recent of her seven collections of stories is My Hearts Are Your Hearts. Australian short story author, Julie Koh borrowed from the fashion industry when she used the expression ‘capsule collection’ to describe Capital Misfits: six exercises in economical fiction. Our new digital series, The Capsule Collections, are the indispensable wardrobe staples of short Australian fiction – essential reading you can take with you anywhere. A platform for digital-first collections, the series will include short stories as well as verse novels and novellas. 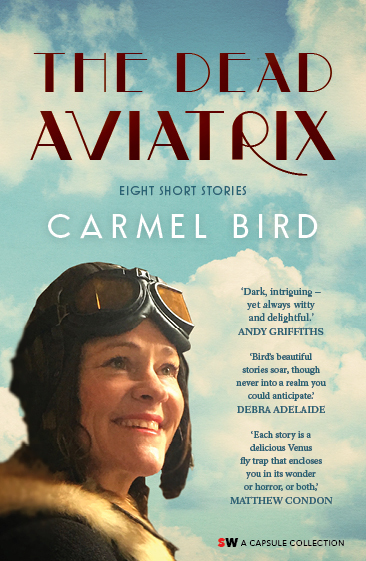 The first publication in The Capsule Collections series is The Dead Aviatrix: Eight Short Stories by Carmel Bird. Forthcoming titles in the series will include those selected from submissions to The Carmel Bird Digital Literary Award.